On January 5, December Class and Component Prices were announced. 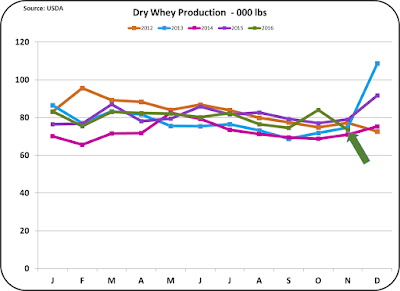 The Class III price set a two-year record high at $17.40/cwt. Prices of all commodities used to calculate component prices were up. Other Solids made a jump to $.21/lb. While this price is still well below early 2015 prices, it is the best price in the last 18 months. 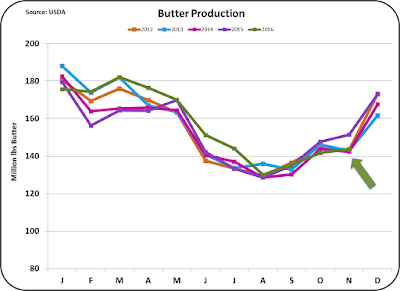 Demand for butter continues to outstrip production, requiring imports to make up the shortfall. 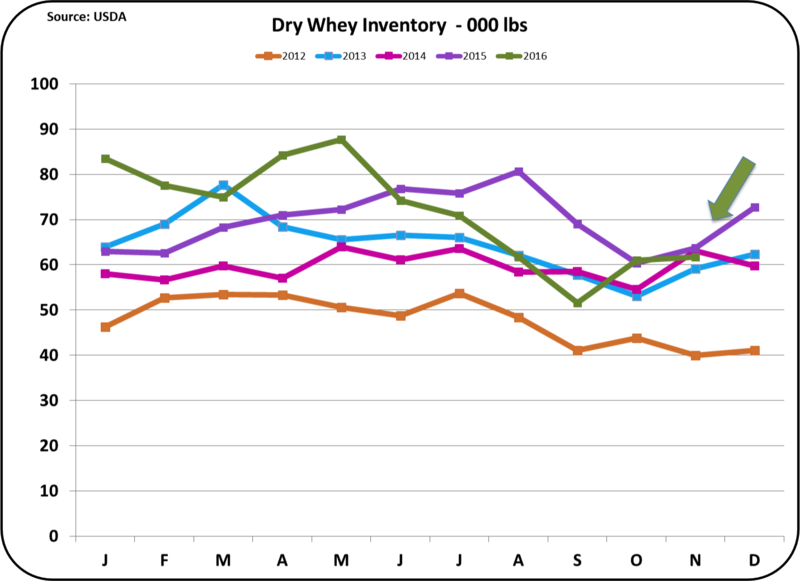 While the price of milk protein dropped (the only red on the dashboard chart below), it was only because of the major increase in the price of butter. See this prior post for a review of this relationship. Even with the significant increase in the price of butter, and therefore butterfat, the price of milk protein still stayed above the price for butterfat. 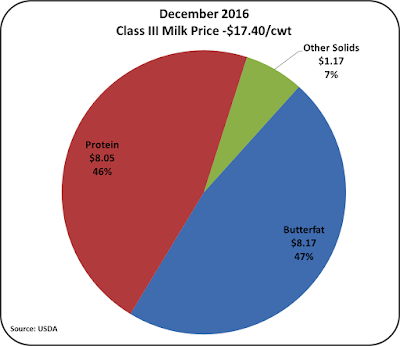 Milk protein received a price of $2.69/lb. while butterfat received a price of $2.34/lb. 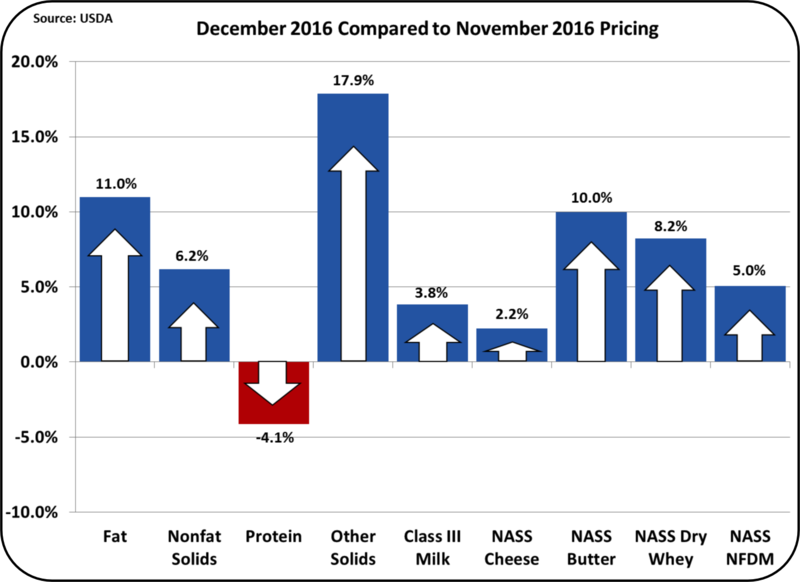 In December, milk protein and butterfat contributed equally to the Class III price. 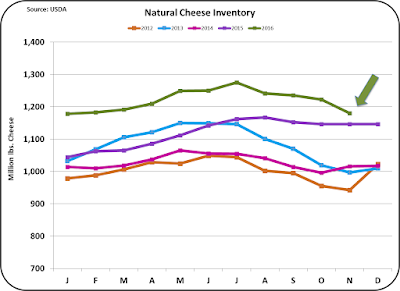 Inventories of cheese, butter, NDM and dry whey were all at reasonable levels. 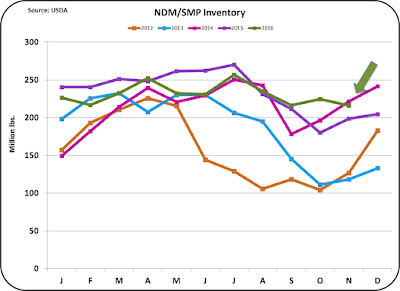 The data shown below is for the end of November, the most recent inventory data available. 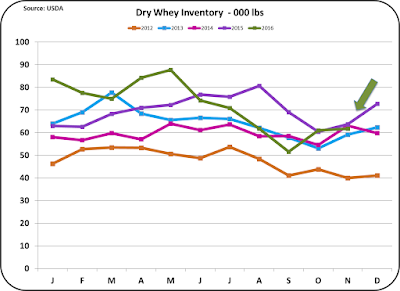 If those inventories continue to hold when December data is released, the year of 2017 should have a strong start with inventories in line, international milk production down, and rising domestic dairy prices. 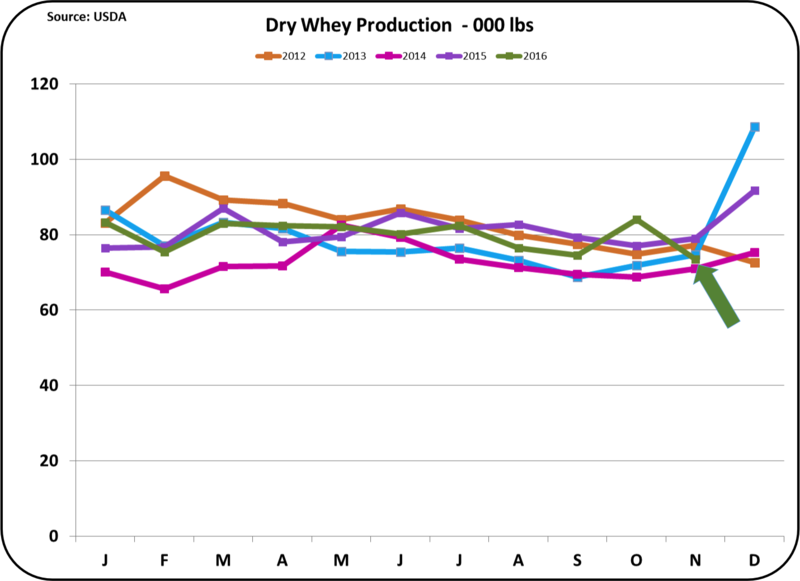 Production is also well balanced with no excess production in the major commodities used for pricing milk components. 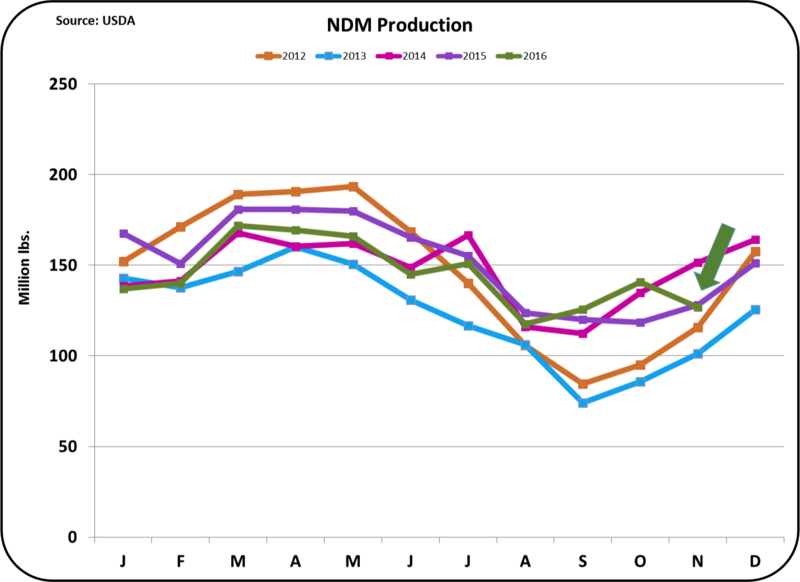 On each of the four charts below, production is down from the prior month. 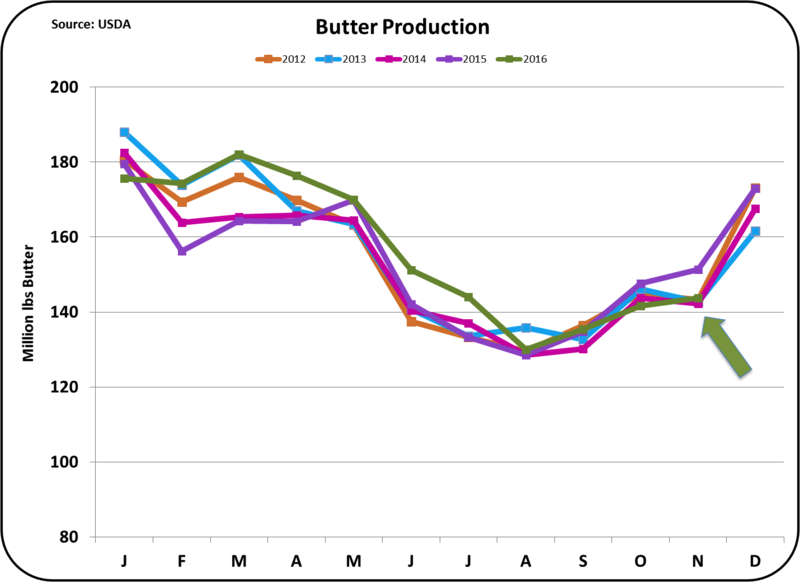 After seeing some expansion in butter production in the first half of 2016, production has fallen below prior year levels in the second half of the year. 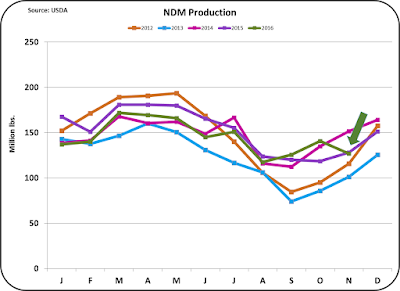 Production is now running at the same level as 2012 through 2014. 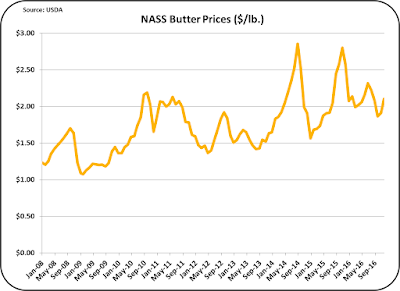 Butter prices remain very high. 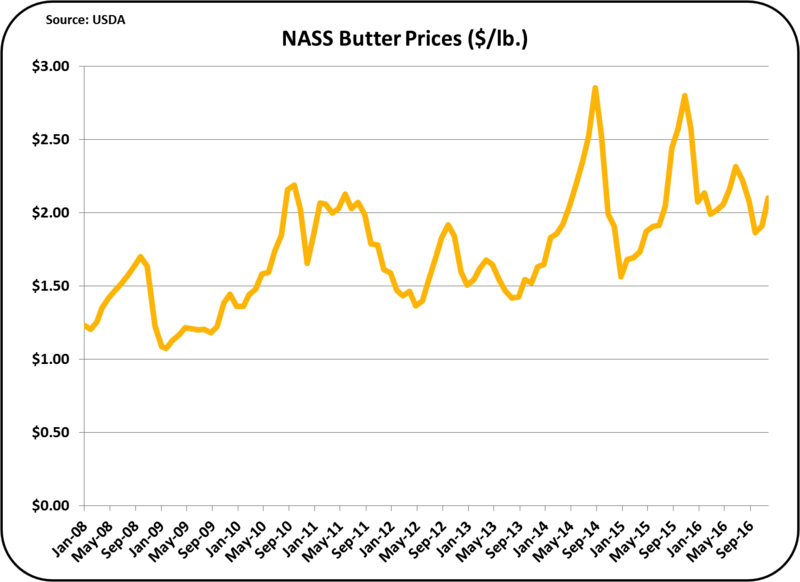 International butter prices have risen significantly, but the U.S. prices remain the highest prices in the world with roughly a 10% premium over the international markets. 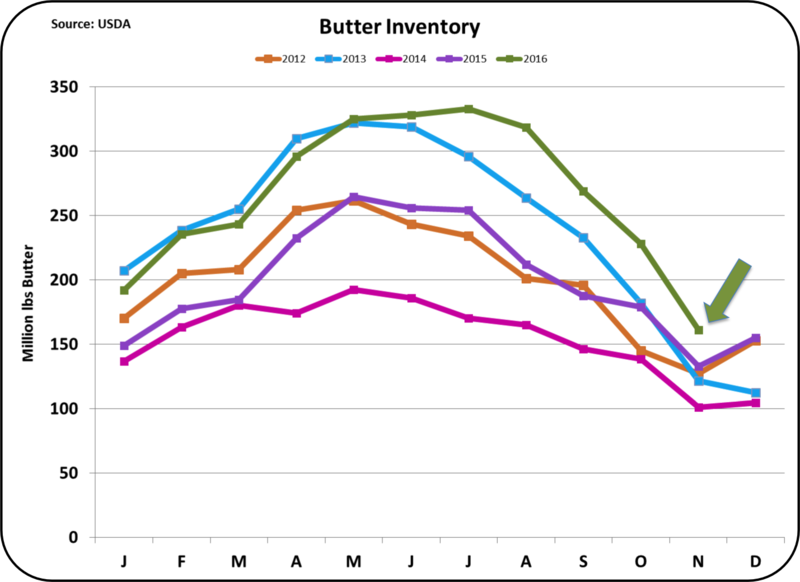 In the next post, imports and exports will be reviewed, but it seems certain that butter exports will remain near zero. 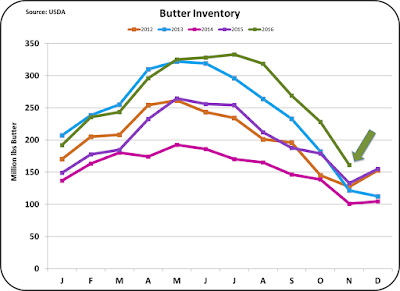 With tight supplies and high prices, exporting butter is very tough. 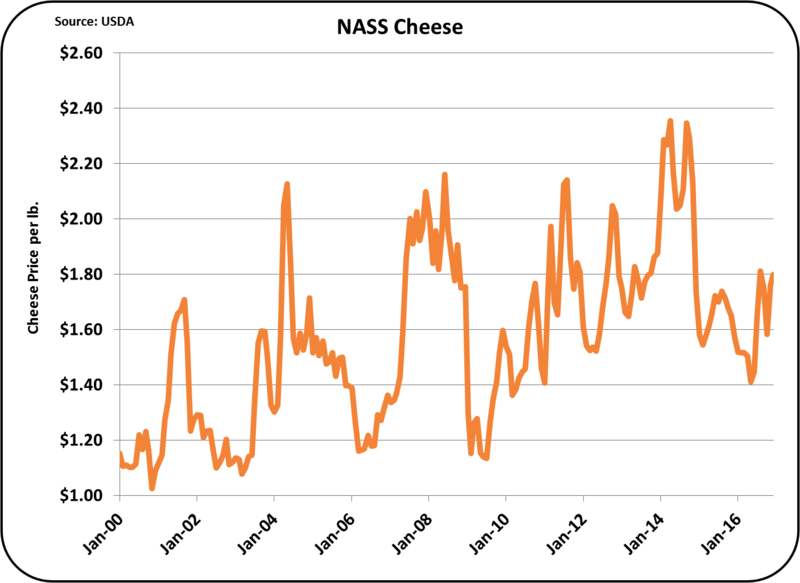 Cheese prices are the highest in two years and competitively priced compared to the international markets. 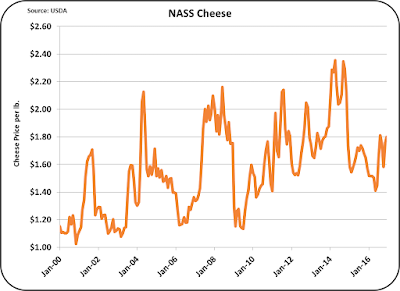 However, compared to historical prices, the price of cheese is nowhere near record levels. 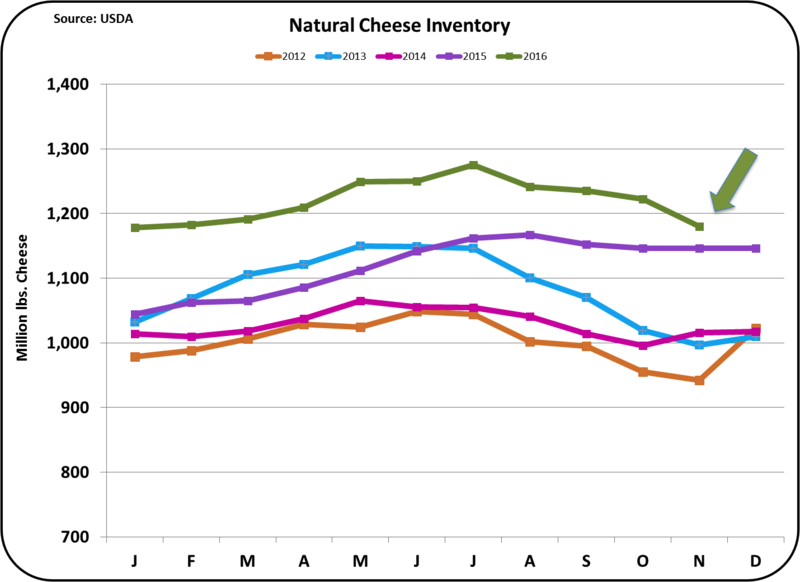 There is definitely room for growth in cheese prices which could lead to increased milk protein prices in 2017. 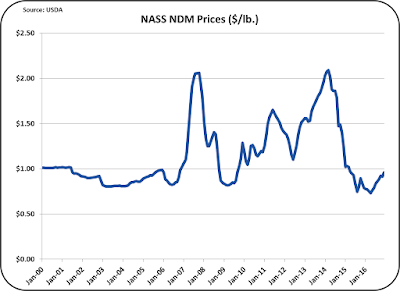 The price of NDM, while up, is still low compared to historical prices. The U.S. is priced competitively with the international prices and has been able to move significant volume. There is also room here for price improvement in 2017. 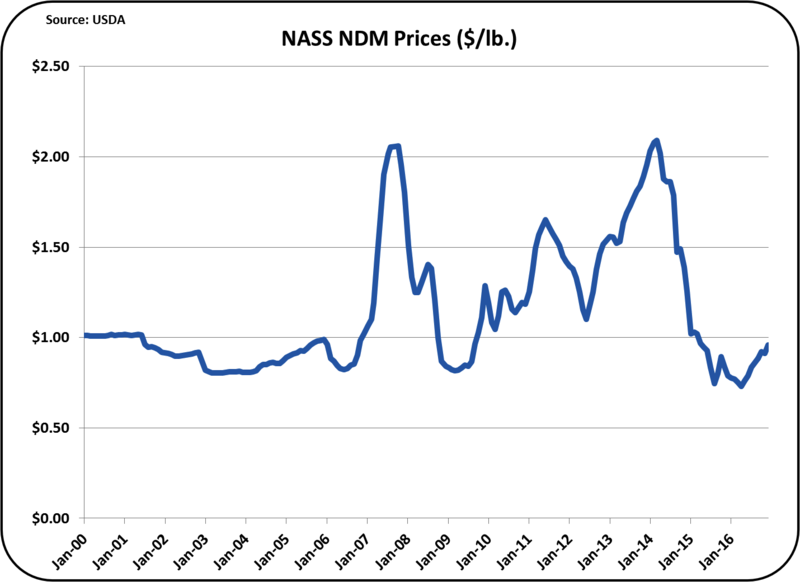 Because so much NDM/SMP is exported, the domestic U.S. price is very dependent on the international price. 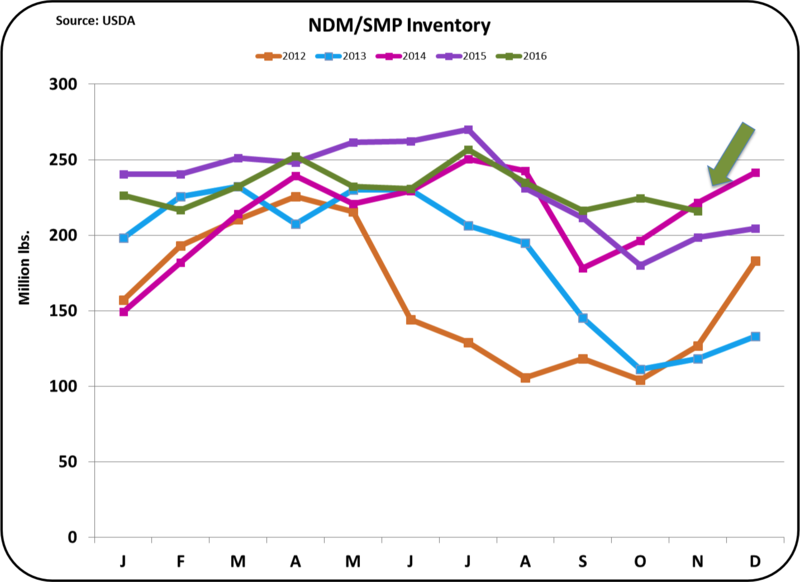 As full year 2016 data becomes available, a full analysis will be made on this blog. That will probably not take place until February. 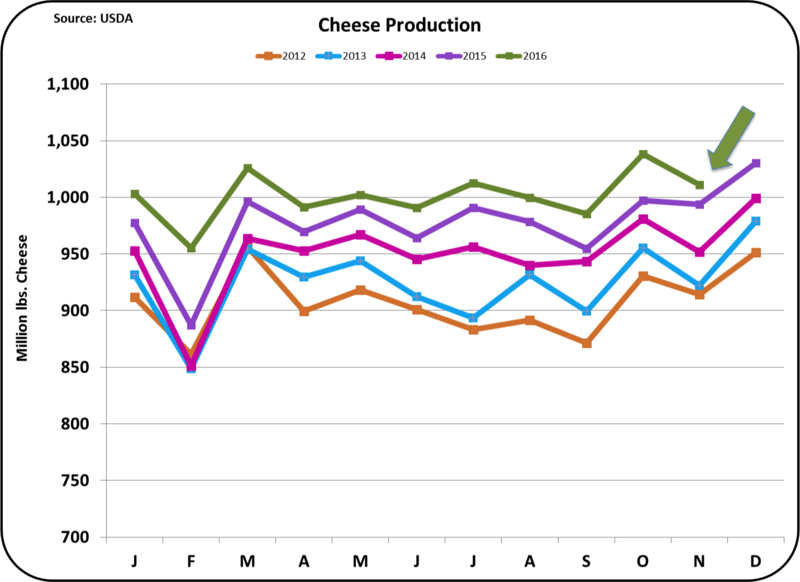 However, looking forward, there are important changes that could take place in the U.S. dairy landscape. One of the big ones is the possible transition of California to a Federal Milk Marketing Order. 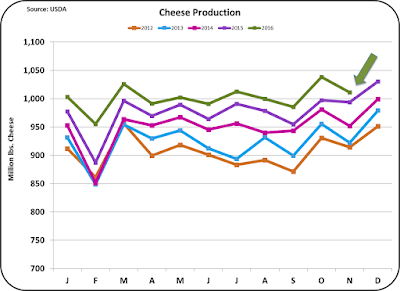 This could put California on a more level playing field with other parts of the U.S. and stimulate both domestic dairy growth and international dairy growth. More on this in an upcoming post.